Do you see this child smiling as she plays? Two years ago at the spring recital she froze because she could not remember how to place her hands to begin one the pieces that she was doing without reading the music in front of her. The last spring recital I watched her work herself up into being nervous with that memory and because everyone else was nervous so she was being like them. This time I again saw that part of her that I had known since she was four years old...the child who loves to perform and is not at all nervous. I was so glad to see the girl be her talented self, that little child without stage fright in a half grown body, that one child that stands out and steals the show because she looks like she enjoys entertaining the audience. 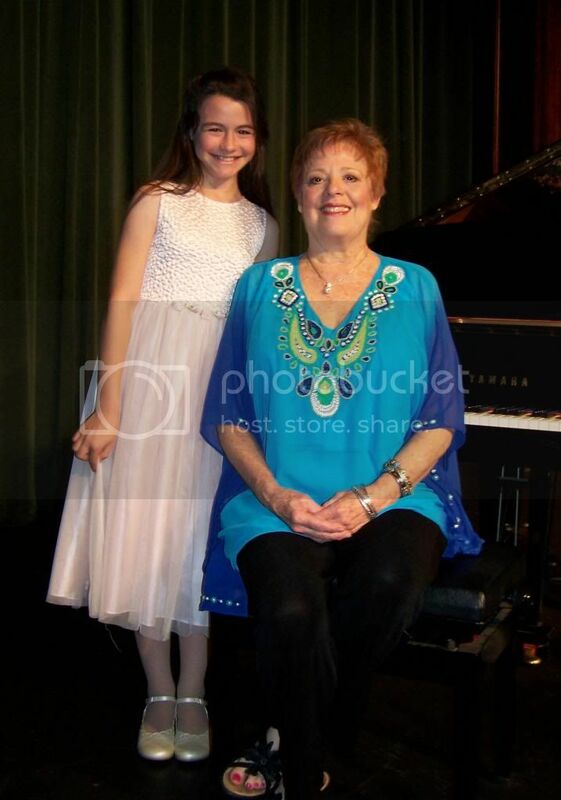 You may think I am just bragging, but every year she has performed, people would tell us how they were impressed with her performance and not just her piano playing, but that certain showmanship that so pleases the crowd. After her performance on Saturday so many people came up to us to tell us well she performed, how poised she was, how confident she looked, how she seemed to enjoy playing the piano, etc. A few said she looked like an angel. I could have told them how she changed her dress last minute and left her room looking like a tornado hit it—maybe she is the Bedroom Tornado Angel? Then there was how she had a fight with me about curling the ends of her hair—just the ends!—and was in tears as I did it when we were running so late that I was not sure we would make it for the beginning, even though she would not be playing until the second half and how I struggled with a waterfall braid she asked me to do (but would not allow me to curl) that I finally got in the car on the way there. I was far more stressed out that she was, but we did reconcile on the hour drive and all was forgotten. This piano recital program was one of the shortest because so many children just could not attend due to schedule conflicts mostly in sports activities. I did the recital programs again this year, but it was challenging in different ways. First, the parents of one student came up with this idea to create a database for piano and dance recital programs asking Trudy, our piano teacher, if she would be willing to be a test case for this venture. This meant I would not have to type in the data, but as I found out it also meant that there would be far more formatting issues for me as the process produced full page programs and we use folded paper for a half page print out. Perhaps because I was fasting and just could not get motivated to do the programs which means I did not design the covers earlier when I should have. There was also the challenge of this odd problem created when my husband hooked up one older printer on the wireless network so that even though I put in 60 copies it would only print one—yes, I ended up pressing the printer button over 300 times that night! I finished at 3:00 AM Friday morning. Since there was no piano lesson on Thursday, my errand day was moved to Friday and so I did the day with four hours sleep to make rehearsal at 3:00 PM and hand over the programs. I know I am biased, but I ask you does this girl so play the piano that even her little mess-ups just seem...cute? I have been reading! I promise I have been reading. Just not up to leaving a comment as your life is as least as complicated as mine just now. I think the Princess' playing is maturing nicely & I particularly enjoyed the duet because they looked like they were having so much fun! I know Cait loved playing duets & if there had been more of that she might still be playing the piano ~ but once she discovered singing, well, that was her love! I understand. Much to do here as well. We were ill for a few days this week as well, but are better now, so it is about catching up on everything for the next few days.